In the early 1890s, eight railroads were party to an at-grade crossing near the Illinois/Indiana State Line in Hammond, Indiana. The eight railroads, who collectively built the original State Line Crossing were Chicago & Western Indiana Railroad Company (purchased by IHB, no longer in existence); Chicago & State Line Railroad Company (NicklePlate now Norfolk Southern Corporation); the New York, Chicago, & St. Louis Company (NicklePlate now Norfolk Southern Corporation); the Chicago & Erie Railroad Company (abandoned after the creation of Conrail); the Louisville, New Albany, & Chicago Railway Company (tracks removed no longer in existence); the Chicago & Calumet Terminal Railway Company (now B&OCT (CSX)); the Michigan Central Railroad Company (purchased by IHB, tracks removed no longer in existence); and the State Line & Indiana City Railroad Company (tracks removed no longer in existence). This crossing originally consisted of a manned tower located on the northwest corner of the interlocking. In 1896, a ninth railroad, the Hammond & Blue Island Railroad Company (now Indiana Harbor Belt), entered into an Agreement with the railroads listed above and began its presence at this crossing where the present tower now exists. At that time, the parties mutually agreed to convert the crossing to a signal controlled interlocking. The current tower measures 100 feet by 15 feet, was built in 1906/1907, and is situated on the northeast portion of the interlocking. During the period of 1906  1908, the mechanical interlocking system was built. National Switch and Signal Company from Easton, PA built the mechanical locking bed and signal equipment. This mechanical locking bed interlocking tower is the largest one of its kind in North America. The locking bed alone is over 95 feet long and has 196 levers with 28 spares spaces, for 224. In 1908, the Kensington and Eastern Railroad Company (now Northwest Indiana Commuter Transportation District also known as "The South Shore") entered into an agreement with the Indiana Harbor Belt Railroad Company (IHB) to construct a railroad crossing over the tracks of the IHB just north of State Line Tower. In 1910 the Kensington & Eastern became a party to the interlocking agreement and was included in the interlocking limits of State Line. Throughout the years, modifications were made to this interlocking, one in particular, occurred in 1956. In that year the then operator and owner of the tower, Chicago & Western Indiana, installed a new illuminated board for each interlocking track circuit and each approach circuit designated by various colors. The track diagram on this illuminated board consists of a print of the track layout, and the interlock functions were sealed with a fiber backing panel and a sheet of transparent plastic. The sealing, which involved the use of plastic sheeting together with a liquid adhesive plastic, was performed by the means of a heat and pressure process. This resulted in a complete and permanent seal between the plastic face, the print, and the backing panel. The plastic face protected the entire diagram from dirt or blemishes and wiping with a damp cloth easily cleaned the smooth surface. This panel currently remains in service today. This mechanical interlocking was manned 24 hours a day, seven days a week by railroad personnel who controlled the movements of all trains through this interlocking. Over the years, this interlocking has seen various changes in railroad ownership and usage. In the late 1980s the ownership of this tower changed hands from Chicago & Western Indiana Railroad to the Indiana Harbor Belt Railroad Company, its current owner. In addition, over the years many of the original ten railroads no longer participate in this interlocking. Currently, the Indiana Harbor Belt Railroad, CSX Transportation, Inc., the Norfolk Southern Corporation, and the Northwest Indiana Commuter Transportation District are the remaining parties to this interlocking. State Line interlocking has recently gone through another renovation, which consists of remote controlling it from the Indiana Harbor Belt Railroads dispatching center in Calumet City, IL. The renovation was completed on August 14, 2000, and the tower is scheduled for demolition. 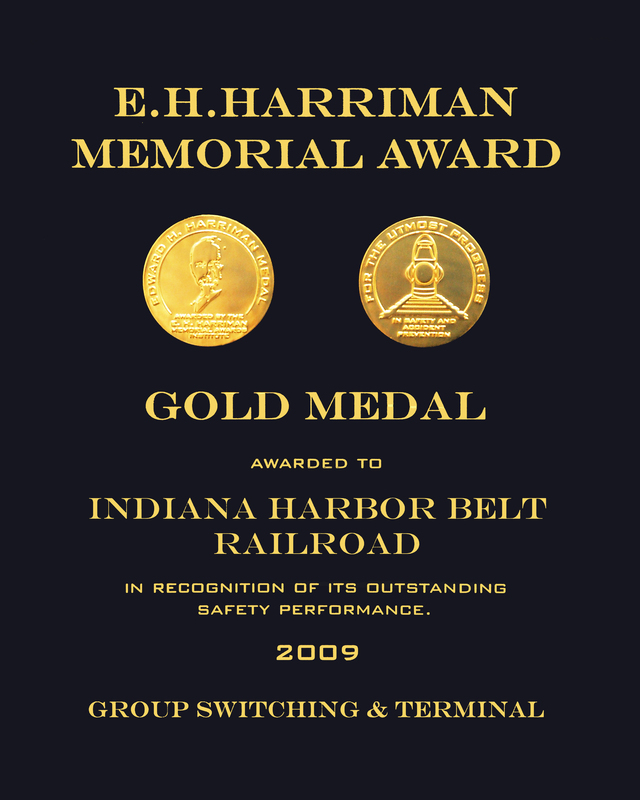 The IHB logo is a registered service mark of the Indiana Harbor Belt Railroad Company. Its use without the express written permission of the Indiana Harbor Belt Railroad is strictly prohibited.